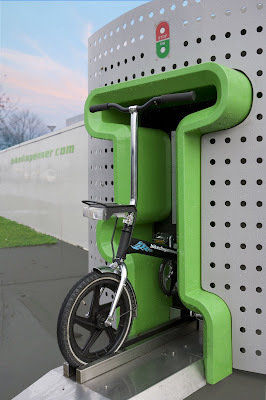 Copenhagenize.com - Bicycle Urbanism by Design: Bike Dispenser for the People! Bike Dispenser for the People! Now here is a wonderfully designed advancement on the famous City Bike system in Copenhagen, providing free [or cheap] bikes for the people to borrow. Ladies and Gentlemen - The Bike Dispenser. A Dutch company has been really on the ball in thinking up this brilliant system for providing large numbers [50-100] of specially-designed bikes to whomever fancies to use them. The goal is to integrate the bike more into the daily commute and the system is earmarked for placement near train stations in the Netherlands. 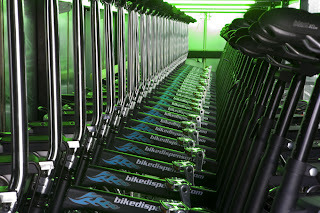 In October 2007 a Bikedispenser opened at the station at Arnhem-Zuid, primarily for usage by commuters between the station and the industrial areas of Gelderse Poort and Kronenburg. Many people ride their bikes to their departure train station, but few have a bike on the other end for the final leg between their arrival station and their place of work or education. With a handy chipcard, you release a bike, ride to work and deliver it back at the station after quitting time. Brilliant stuff. We love it. We only wish we thought of it first. Check out the website [in Dutch and English] for more information.